The Department of Human Sciences in the College of Education and Human Ecology (EHE) at The Ohio State University made big news last year when it announced a groundbreaking partnership with the Association for the Healthcare Environment (AHE) to develop the first undergraduate certificate program in health care environmental and hospitality services. Recognizing the similarities that exist in customer-service management in the hospitality and health care fields, the program is designed to incorporate best practices in the preparation of both hospitality and environmental services (ES) professionals for leadership positions in health care ES departments. Furthermore, this online certificate program helps to bridge the current gap in educational opportunities available to those employed within the ES sector. In May 2016, three Ohio State faculty members met with AHE Executive Director Patti Costello and other members of the AHE leadership and educational staff at their offices in Chicago to explore the feasibility of developing an educational partnership. The connection was obvious and considerable energy and dialogue were exchanged as ideas about the planning process, promotional activities and next steps were discussed. Plans were made for AHE leadership to visit Ohio State to engage with EHE Dean Cheryl Achterberg and other college counterparts, and to make a presentation to the hospitality management students and faculty concerning this important initiative. Presentations by members of the university’s hospitality management faculty, describing the certificate program curriculum, also were made at the 2017 AHE Exchange Conference in Orlando, Fla. Since then, the curriculum for the certificate program has been established and the first course was made available to 47 students during the current spring semester. Development of the Healthcare Environmental and Hospitality Services (HEHS) certificate responds to growing evidence of the strong connection between the hospitality and health care fields. Hospitality provides a commitment to meeting guests’ needs as the primary focus in commercial operations through a host-to-guest relationship. Hospitality includes several subsegments like food and beverage and lodging operations. he lodging industry, as a segment of hospitality, has the most overlap with health care. This includes all businesses that provide overnight accommodations for guests, hotels being the most notable example. They provide sleeping rooms for their guests as well as different amenities like food service; internet access and copying services; in-room hair dryers, irons, ironing boards and microwave ovens; and indoor pools and exercise rooms. Hotel amenities are, therefore, defined as all additional hotel products and services that are designed to attract and satisfy guests. Health care, on the other hand, is often defined as the prevention, diagnosis and treatment of disease, illness, injury and other impairments with a goal to improve and maintain human health. As such, the health care field shares a number of common features and characteristics with hospitality. Both health care and hospitality are service fields that have a strong focus on customer experience and satisfaction. On a more technical side, health care and hospitality also share a number of common characteristics. Both offer round-the-clock residential services including bedding, maintenance, security and food service. They often share similar organizational structures and both fields have high labor costs and fluctuating demand. Customers in both fields have extremely diverse backgrounds. In many ways, health care and hospitality share a common history. Until the late 1800s and early 1900s, advanced health care was provided primarily for the privileged. During this period, hospitals used hotel-type imagery and physical design to appeal to prospective patients. The focus of health care was often well-being and enjoyment of the patient, accomplished with hotellike amenities. In the 1930s, health care changed dramatically as it entered a period of mass health care. Providers focused increasingly on the technological aspects of medicine and less on nonmedical services. The design of health care institutions shifted toward an institutional appearance with the intention of increasing operational efficiency and patient turnover, as well as reducing operating costs. The 1946 Hill-Burton Act, one of the milestones in health care institutional design, required that hospitals meet minimum technical standards that de-emphasized the importance of hospitality features and nonmedical services. Since the late 1980s, however, there has been a trend to rediscover hospitality in health care and new hospitality amenities are becoming increasingly common in modern hospitals. Additionally, in 1995, the HCAHPS scores began to be used in U.S. hospitals. These assessments were crucial for the reintroduction of hospitality into health care, because the focus is on a number of features that resemble traditional hospitality more than traditional medical services. HCAHPS has several main elements, including service quality, hospital environment, pain-management medication communication, discharge information, food services and overall hospital rating. From HCAHPS, modern hospitals not only must focus heavily on the quality of medical services, but also nonmedical services. Quality is often defined as the consistent delivery of products and services according to expected standards. However, service quality, as one of the most important dimensions of overall quality, is viewed as the process of helping guests by addressing their wants and needs with respect and dignity in a timely manner. The question becomes, “What can hospitals do to improve their quality?” Primarily, hospitals need to improve customer service, and improve both nonmedical products and their physical environments. This would enhance psychological and emotional well-being not only of patients, but also that of visitors and employees. Other fields also have found that the philosophy of hospitality can help to improve exchanges between service providers and customers, leading to a better customer experience. Being hospitable involves more than a welcoming and friendly attitude; it means providing true care and compassion to patients with the goal of creating a memorable experience and genuine connection. A number of hotel-style products can be incorporated into health care facilities with these goals in mind; for example, private rooms, concierge services, restaurant-style food service and a valet service. Finally, by considering final design touches to make health care facilities feel more like hotels, patients and visitors feel more welcome, leading to higher satisfaction, a better experience and potentially enhanced recovery. There are several recommendations that health care managers could glean from their hospitality colleagues. Managing by walking around and communicating with patients and visitors keeps employee morale high and demonstrates a collective dedication by everyone. Managers might use comment cards to learn about patient and visitor satisfaction. These short questionnaires could go beyond HCAHPS and start to focus on different nonmedical services. Additionally, it is important to include benchmarking, to search for best practices and to understand how they are achieved as a measure of a health care organization’s performance. In benchmarking, health care organizations should not only compare themselves with other hospitals, but also with hospitality companies and other service providers. Finally, health care management should instill in their employees that they are entrusted to provide the best service and grant them authority to make decisions that can help to improve the patient experience. One of the best ways to accomplish this is by creating cross-functional teams of employees from different departments that can collaborate to resolve service problems and improve the patient and visitor experience. Introduction to Healthcare Environmental and Hospitality Services. This course introduces a broad range of nonmedical health care topics. It gives students a basic understanding of health care business and introduces them to such critical operational areas as sanitation, infection control, staffing, waste management, regulations, design and food service. The goal is to prepare students for the health care ES management profession by exposing them to the fundamentals. Consumer Experience in Healthcare and Hospitality. This course will prepare students to implement robust customer-experience strategies within health care and hospitality organizations, with an emphasis on improving the patient and visitor experience. Students will learn the business of health care, how hospitality and management principles translate into this business model, and how innovations in the hospitality sector can advance the interests of the health care setting. 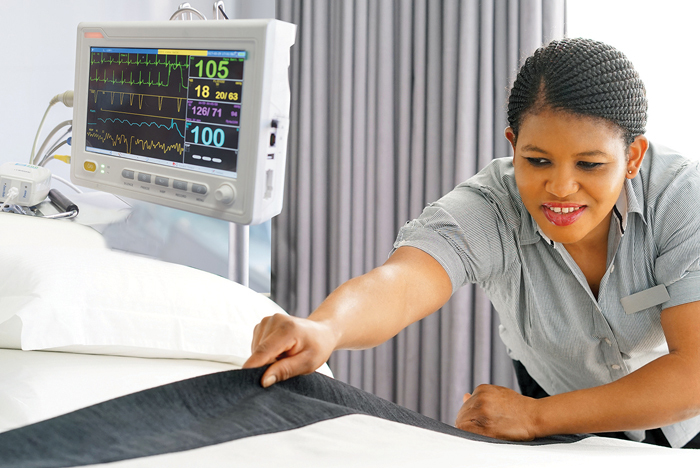 The course will unite the conceptual and the practical aspects of hospitality in health care settings to offer students the hospitality perspectives, principles and skills needed to resolve pressing health care challenges. Infection Prevention in Healthcare and Hospitality. While the final course content is still under consideration, the primary focus will be on microbiology, epidemiology, infection prevention and food safety. Healthcare Environmental Services Internship. This course is a semester-long internship in a health care facility that will expose students to different departments and nonmedical positions. Its objectives include: developing a more comprehensive understanding of the health care business, and applying knowledge from previous classes to specific health care tasks and procedures. Upon completion, students will be able to recognize, interpret and assess key health care business problems; implement customer experience management systems and strategies in health care organizations; recognize and assess key infection-prevention problems in health care and hospitality facilities; and understand different health care departments and nonmedical positions. The initial goal of the HEHS certificate was to provide better integration between the health care and hospitality fields. This opens up new career paths for hospitality students and provides new educational options for ES professionals. The long-term goal of the partnership is to build on the certificate, with an eye toward developing a bachelor-degree program that would train professionals and students to deliver hospitality-style services to improve the patient and visitor experience, elevate the ES field and improve health care operations. Xanitos is a management company that provides hospital housekeeping (EVS), patient transport, and laundry services to hospitals nationwide.